the impact of technologies on needs assessment methods. This issue will help professionals within public and private organizations conduct useful assessments, ones leading to results that can be applied in decisions. This is the 144th issue in the New Directions for Evaluation series from Jossey-Bass. It is an official publication of the American Evaluation Association. James W. Altschuld is professor emeritus in the College of Education and Human Ecology, The Ohio State University. Ryan Watkins is an associate professor at George Washington University in Washington, DC, and founder of www.NeedsAssessment.org and www.WeShareScience.com. 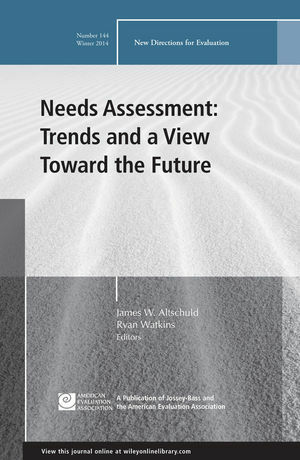 This chapter provides an overview of needs assessment’s rich history, definitions, models, tools, and techniques that closely align its theory, research, and practice and its association with several other fields, notably strategic planning and evaluation. The nagging concern over numerous definitions of a “need” and how those definitions affect the assessment of needs are the focus of this chapter. While looking at needs is commonly done in many public-sector agencies, the authors question how it is done and if it focuses too narrowly on deficits or gaps and not incorporating assets. In this chapter, the author examines how needs assessments can identify solutions that will improve individual and group performance, as well as produce valued business results. This chapter describes needs assessment within the context of a specific workforce development project, offering the assessment process, phases, and levels, and the implications and lessons learned when considering training needs. Needs assessments are occurring across the globe and these authors not only provide examples of such practice, but they also give useful guidelines for how to navigate the choppy waters of culture and tradition. For a period of time, there have been sharp criticisms of the premise of needs (starting from deficits) as opposed to asset-based planning and a hybrid model of the two as a new approach to planning and development is explained. As the practice of needs assessment evolves, newer methods are appearing on the scene as well as the necessity for conducting practical, applied research on the conduct of assessment.